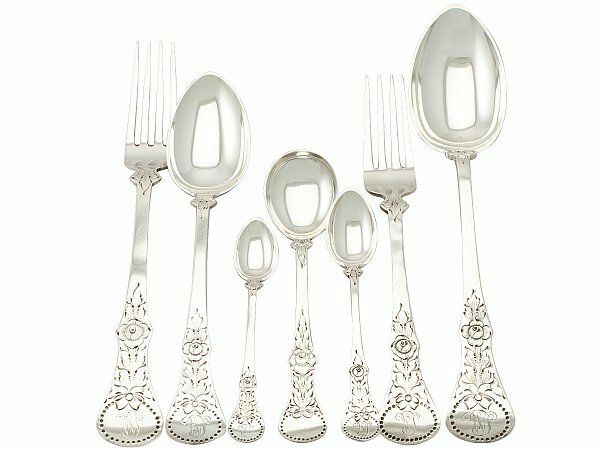 The pieces of this exceptional antique Norwegian silver straight* flatware service for six persons have been crafted in the King's shape form. The shaped tapering handle of each piece is embellished with an engraved floral pattern to the terminal in addition to a simplified leaf design to the shoulders. The decoration to each handle terminal incorporates an oval shaped cartouche bearing the contemporary bright cut engraved initials 'WJ'; the cartouche to the serving spoon remains vacant. The reverse surface of each spoon and fork is plain and unembellished. This Norwegian silver cutlery set can be purchased with knives if so desired, exact matching pattern knives are not available but a similar and complimenting design can be arranged; for further information please contact Andrew Campbell directly at enquiries@acsilver.co.uk. These impressive examples of antique silverware are supplied in felt cutlery rolls; which not only protect the items in storage but significantly reduces tarnishing. 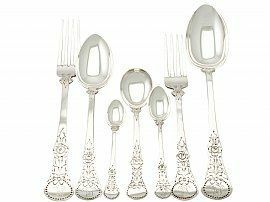 This antique Norwegian silver cutlery set is a very good gauge of silver, excellent quality and in excellent condition. The engraved ornamentation is very sharp. The Norwegian hallmarks struck to the reverse of each piece are all very clear. Reflections in photographs may detract from the true representation of this fine and impressive antique canteen.